Before the Buddha was born into this world, he was a bodhisattva in the heavens – a being destined by his karma for full Enlightenment. From here he witnessed the dark ages engulfing the human realm, leading to its spiritual poverty. Moved by compassion, he vowed to take birth in the world and relieve mankind from their sufferings. When it was time for his rebirth in the human realm, he chose Suddhodana and his wife, Mayadevi, rulers of the Sakya clan, as his future parents. This generous couple was well known throughout the land for their just and noble bearing. 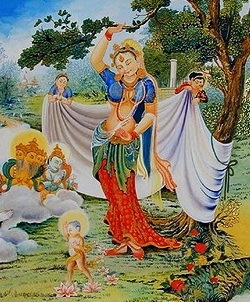 The bodhisattva’s descent from the heavens occurred as a dream to Mayadevi. In this dream, a white elephant approached and touched her right side with its trunk. During this night, the bodhisattva entered the womb of Mayadevi and she became pregnant. The palace fortunetellers explained that the dream announced the queen’s pregnancy, and that the newborn would possess exceptional traits of character. Mayadevi successfully carried her pregnancy for the full term without any complications or pain. Near the end of her pregnancy, she decided to travel to her parental home to have the baby there with her mother, an ancient custom that is still practiced today. It was the day of the full moon in the month of May. The weather was turning warm and so when she came upon a pleasant grove near the village of Lumbini, she saw the gardens overflowing with a rich profusion of green leaves and flowers and decided to rest. The queen instructed her party to camp among the shady trees. She stepped out of her palanquin and reached to grasp one of the branches of a flowering tree. No sooner had she done so than she felt the throes of birth. Standing thus, with her hand to the branch, she delivered her child, and the the baby destined to be the Buddha was born in the gardens. Present to witness this momentous birth were the deities and gods. The advent of the newborn was accompanied by many miraculous events and a great cry of rejoicing rose through the heavens and were heard in the surrounding lands. The joyful father gave the baby the name “Siddhartha”, meaning “accomplisher of aims”. He was also called “Gautama”, which was his clan name. Later he would also be called Sakyamuni or the sage of the Sakya clan. A week after giving birth, Mayadevi died, and her sister Mahapajapati raised the prince. As the son of the king, Siddhartha was provided with the finest upbringing and the greatest luxuries. He received the finest education and mastered all lessons taught to him. In his younger years, he excelled in sports and other contests of skill. The vigorous training befitted the grooming of a future monarch. He was said to particularly excel on the horse and with the bow. He enjoyed all the pleasures of youth but even so he was already known for his wisdom and compassion. His contemplative nature and boundless compassion no longer permitted him to spend his time in the mere enjoyment of the fleeting pleasures of the Royal palace. He knew no personal grief but he felt a deep pity for suffering humanity. 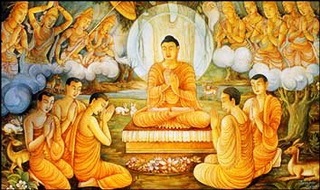 Having made the decision, Siddhartha requested his father to allow him to proceed in his quest for truth. On hearing of the prince’s resolve, his father became extremely anxious and entreated him to revert his decision. However, when Siddhartha heard that a child had been born to him, he decided to make a final break. He left the luxurious palace of his father, leaving behind his devoted wife and son. The first thing Gautama did after leaving his father’s palace was to cut off his long and beautiful hair with his sword. He also exchanged his princely clothes for robes of rags and set forth into the wilderness for a new life in a quest for liberation. 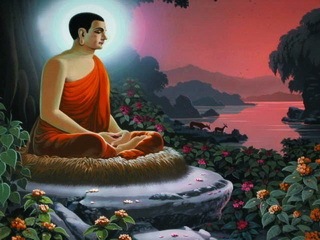 Wandering in his search for Enlightenment, Siddhartha came to a pleasant hermitage by a lovely river, where, for six years, he joined five other ascetics in a way of discipline based on progressively severe fasting. Consequently, his bones stuck out like a row of spindles, and when he touched his stomach, he could almost feel his spine. His hair fell out and his skin became withered. But all this was in vain. However severe his austerities, he gained no real insight into the mysteries of life. He had to face the fact that asceticism had failed to advance him in his quest. He was exhausted from his practice, but one day he heard a passing musician tuning his lute, the strings of which were pulled neither too tight nor left too slack. It dawned upon him that even as he has enjoyed the extreme of sensual pleasure, physical austerity is the other, and that the “Middle Way” between these two extremes is the path to Enlightenment. He thus slowly rose, and went to bathe in the river. He crossed over to the far bank where a village girl offered him a bowl of milk rice. It was the first rich food he had accepted in a long time and it instantly restored his body to strength. Thus nourished, Siddhartha sat under the great and shady bodhi tree near the village of Gaya, just south of the great Himalayas, to make his last bid for liberation. Absorbing himself fully in meditation, he vowed not to move from that spot until he had fulfilled his quest. Hearing this solemn vow, Mara, the manifestation of death and desire, felt threatened. Mara’s power over sentient beings originated from their attachment to sensuous pleasures and the consequent fear of death which leads to intense suffering. Enlightenment would free Siddhartha from Mara’s control and provide an opportunity for others to free themselves also by emulating him. Having gained Enlightenment, Gautama came to be called the Buddha; the Awakened One, indicating the unique quality of his mind. Initially he was hesitant to teach others of his achievement, doubting that people would be able to realise or understand the deep and profound nature of his realisations. But the god Brahma entreated him to teach saying that there were beings ‘with little dust in their eyes’ who would be able to understand his teachings. He first went up to Sarnath where he met the five disciples who were his previous companions. Though they had deserted him after he had given up the practice of asceticism, the awesome aura from the Buddha now attracted them. 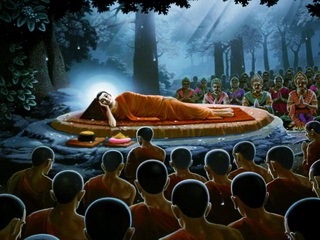 Here, he gave his first sermon setting in motion the wheel of the Dhamma as he expounded the doctrine of the Four Noble Truths and the Eightfold Path. Hearing his discourse, they became his first followers. Kondanna, one of the five was the first to destroy the lesser fetters in his mind and became the first saintly disciple of the Buddha. Over the next 45 years, the Buddha traveled great distances traversing the Ganges valley and teaching people from all classes of society. These were princes, noblemen, warriors, beggars, prostitutes, traders and children. Following the Buddha’s instructions thousands were ordained as monks and nuns. These monks and nuns as well as many lay people, following the Buddha’s instructions were able to purify their mind of delusion and also attain to Enlightenment, thus liberating themselves from the bonds of existence. After a career that brought him to the age of 80 Buddha finally reached the city of Kusinara, where he asked his disciples to spread a couch for him in a grove of trees. He laid there, reclining on his right side, facing west, with his head supported by his hand. He realised clearly that death was approaching. Towards midnight of the same day, the event known in Buddhist terminology as the Parinibbana, or “Final Nirvana” took place. It was another full-moon night. The Enlightened One brought his mind through various planes of meditation until he passed away into final liberation from this existence. The trees burst into full bloom even though it was out of season, and showered the entire grove with their flowers. And the world was like a mountain whose summit has been shattered by a thunderbolt; it was like the sky without the moon.